rating: 4/5 [in the genre] or 7.5/10 [all books I’ve ever read]. recommended for: Fans Cassandra Clare (e.g. 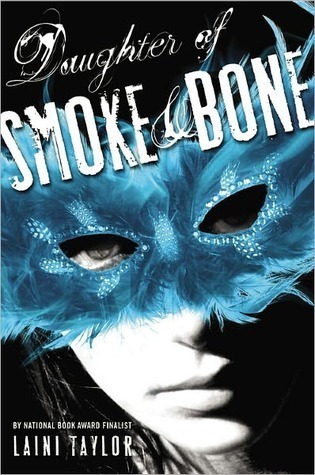 City of Bones), tragic romance, exceptional worldbuilding, and angels and demons. I went into this book expecting to fall madly in love with it. I did, and then I didn't. The writing is gorgeous, like something out of a poem but with more edge and more accessibility. The characters are witty, rich, and authentic. The back story and worldbuilding is some of the best and most unique I've seen in fantasy, hands down. I drank up the atmosphere like a drug--you know, the kind you drink?--and giggled with thrills from how clever it was, how interesting the chimaera and the teeth and the wishes, how eerie and beautiful and rich the world and the plot. I loved absolutely everything--until I got to the romance. Then I wanted to kill it with fire. The twist is crazy and clever and wildly cool, but instead of sloughing off the stain of insta-romance for me, it just gave me another instance of insta-romance. I would have loved everything about this book if the initial romance had built up realistically, but I found myself groaning over another Romeo and Juliet retelling. That said, everything else about the book was near perfection and I will be reading the rest of the series and hoping that Taylor's incredible talent will take the sour taste of instalove from my mouth. But to be fair, it's hardly the worst instance of instalove I've seen, and it could almost be excused as strong attraction at first sight turned love. So not enough to keep me away from the sequel. So, you know why that point is gone. Oh, right. I see you, I love you, OMGSTARSANDRAINBOWS. Yeah. I don't have a problem with attraction at first sight or lust at first sight or liking at first sight, but I felt that the connection between the two characters was a little extra-strong for my taste. My opinion now isn't as extreme as it was when I first read. The backstory does excuse the instalove that first irked me. However, I still would have enjoyed seeing more of how the two characters fall in love rather than being told that they do. Then I would have been okay with the quick connection, as Veronica Roth brilliantly describes. Complaints out of the way: this was a well put together book. The plot unfolds at a good pace, leaving you tantalizing hints that rip you along. I think the only bad part was the very extended flashback, which yanked me out of the action and sort of made me forget what was going on by the time I got back to the present. That said, the twist was fantastic, the ending came at a great place, and I had a super hard time putting it down. Fantastic. Think you know angels and demons? Ha. You a'int seen nothin' yet. Taylor takes old myths and combines them with dreams from her own imagination, creating a secret world of seraphs and chimaera who inspire the religions of humans but have their own myths and their own wars. The angels are made out to be kind of bad guys and I'm hoping for more nuance later, but it's a really richly detailed world, so I can't much complain. The magic system--pain for power--is clever and exciting. I'm also in love with the concept of the wishes. Am I the only one not in love with Akiva? Honestly, I found him to be kind of tritely stoic and self-righteously martyr-y. Blech. I loved Karou, though. I think I loved her even more when she was just the art student. She's witty and delightful. A little Mary Sue-ishly beautiful and talented, but I think she has enough faults to keep her likeable. Brimstone and the other chimaera are some of my favorites. Especially Kishmish, weirdly enough. And Zuzanna, the obligatory best friend, is spunky and awesome and given way more screen time than the usual best friend, which I found refreshing. A main character who actually cares enough about her relationships not to abandon them totally for some hot fantasy guy? Yes please! The Madrigal storyline was pretty awesome and I enjoyed her character (while still finding her somewhat naively you-mean-I'm-pretty? annoying), but I wish Taylor hadn't strayed into the mean-homely-girl-jealous-of-pretty-girl trope. Karou is an art student and you can tell that in every inch of her perspective. The world we're given is colorful, tactile, vibrant. Taylor layers each page with rich descriptors and unusual phrases that are so spot-on. It's not overwhelming or purple though, just very beautiful. Like I said, the extended flashback was disorienting. I would have preferred parallel stories and then later seen how they came together. A vibrant, richly detailed epic of good and evil, with a freshly unique world and unforgettable atmosphere. I love this series. Laini Taylor's words are so beautiful and I liked Karou, she is kickass and loyal and amazing! I liked Akiva a lot... at first. The end changed that, but the Chimera and Angels story are very original and rich (she includes even the legends of each race!). Check the second book, is as good as this (with less romance but still amazing). Agreed! Karou sticks by her friends and family, which is really admirable. So true. The legends were one of my favorite parts. I'm planning on it. I think I might even enjoy the lighter romance since that was something I struggled with in this one. A nice read with a some food for thoughts. Angels are not necessarily good all the way. What appears to be the bad guys are what they appear all the way. The story reads easily, tickles the imagination, swells you up on the character's world.